Investing in a slow cooker is a purchase you will not regret. They are stress relievers by design. These quiet little workers make hectic lives much more efficient. Cook, serve and travel with your slow cooker. They are perfect appliances to prepare and share hot soups, stews, meat, appetizers, desserts and dips with friends and family. We have researched slow cookers for you. Our review guide for the best slow cooker will help you make the perfect purchase for your lifestyle. My slow cooker is my assistant during the busiest weeks and months each year. It earns its place on my shelf. With a bit of prep, my slow cooker works away while I focus on my responsibilities each day. At the end of the day, the only additional effort I need to make is lifting the lid off of the slow cooker, serving and eating. 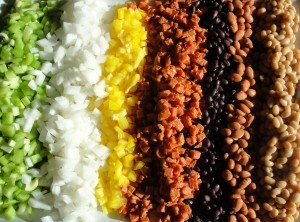 Preparing meals at home is much more cost effective than buying prepared foods or eating out. Home cooking can be a family activity. It allows you to control the quality of the ingredients you eat and the overabundance of fat and salt found in processed food. Creating nutrient dense, flavorful food at home is an appreciated task that is made easier with a slow cooker. 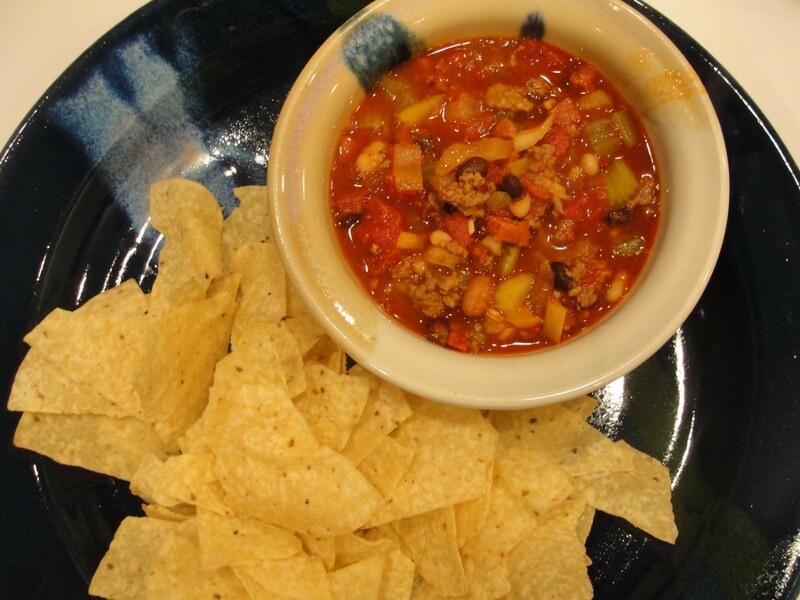 Slow cookers have many uses, but I will share our family favorite chili, soup and stew recipes with you. They are appropriate for an 8 quart slow cooker. Each year during the holidays, my husband prepares Italian Chili several times to share at a number of gatherings with company staff. He takes the slow cooker along with the chili, plugs it in to continue cooking or uses the warm setting to serve. This chili is delicious from the first serving to the last. It is truly a fan favorite and requested year after year. The recipe is adapted from several Italian chili recipes. 2-10 oz. cans RO*TEL diced tomatoes with green chilies. First, brown the beef and sausage in a pan. Drain. Add all ingredients to your slow cooker and stir. Plan to cook on high for 3 hours or low for 6-7 hours. Walk away and enjoy the day. One of my favorite soups in the winter is minestrone. It is calorie light and full of fresh, nutritional vegetables and herbs. 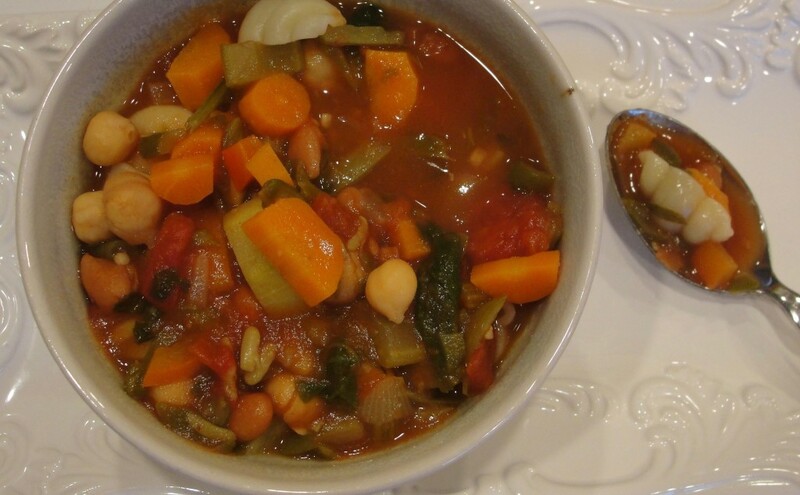 My version is adapted from “Jamie’s Minestrone” on Allrecipes. I do not add oil and using veggie broth rather than chicken stock, which was used in the original version, has reduced the salt content considerably. Plus, it is a complete veggie dish less the parmesan. 1-32 oz. container vegetable broth, I use Pacific organic. 1 package gnocchi shaped or large seashell pasta, cooked separately. Shredded parmesan cheese can be added to individual bowls when serving if desired. Using ½ cup of the vegetable broth in a sauté pan, sauté the garlic, onion, celery and carrots for 5 minutes, stirring occasionally. While the vegetables are cooking, add the remaining vegetable broth to the slow cooker. Set on high for a 4-hour cook time or low for a 7-8 hour cook time. 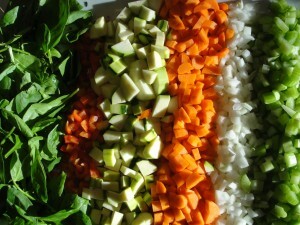 Add sautéed vegetables along with the zucchini, canned items, herbs and seasonings to the slow cooker and cover to cook. Just before serving, prepare the desired number of pasta servings and drain. While the pasta is cooking, stir the spinach into your minestrone. Add a serving of pasta to your bowl, top with prepared minestrone and sprinkle with Parmesan cheese. The last recipe I will share is a hearty beef stew that my pickiest eaters enjoy. I use the basic Beef Stew recipe from The Joy of Cooking cookbook, adapted to suit our taste. I choose to use boneless beef short ribs in my stew because of the wonderful flavor they add. It requires a bit of trimming, but the extra time this takes is worth the flavor in the end. You can also choose precut stew meat to make this super quick and easy. You will coat brown your meat in a pan on the stove before placing it in the slow cooker. Toss until the meat is thoroughly coated with the seasoned flour. Remove the meat and let it rest until the moisture has soaked mostly through the flour mixture on the meat. This small step will help keep the seasoned flour on the meat rather than falling off into your pan when cooking. Remove the browned meat from your pan and add it to your slow cooker. Dab remaining fat from your pan with a paper towel. Add the reserved ½ cup beef broth to your pan and cook on medium heat for about 5 minutes until all remaining crumbs and bits lift from the pan and the broth is slightly reduced. Add this flavorful reduction to your slow cooker. Blend well. Add a cup of hot broth from your slow cooker to the cornstarch mixture and whisk quickly. Add this to your slow cooker and stir until well incorporated. Repeat this step if you prefer thicker broth. 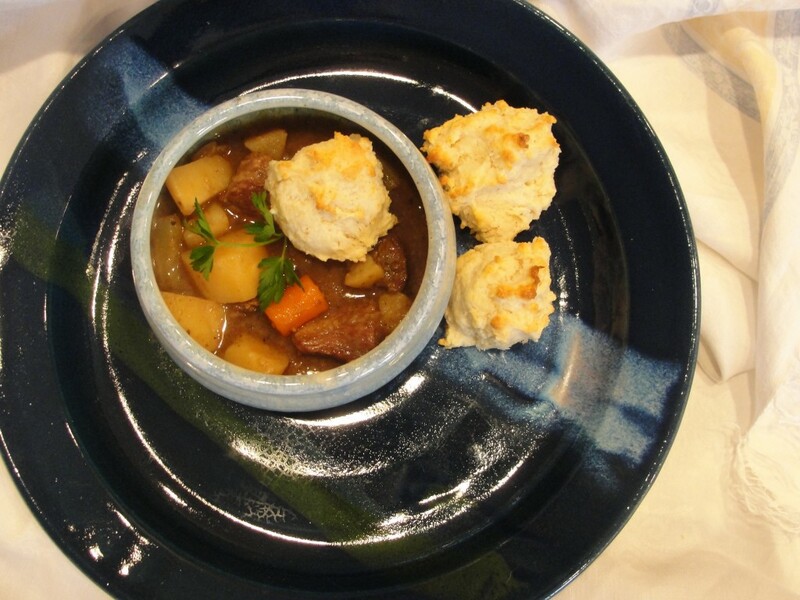 I like to serve drop biscuits with beef stew. They are quick and easy to mix and bake. The delicious recipes I have shared with you are absolute favorites of our family and friends. Each recipe is full of flavor and so easy to prepare. We would love to hear from you. Send us your comments as you test each one. Did you love it? Was it easy?